Product #6539 | SKU H85 | 0.0 (no ratings yet) Thanks for your rating! 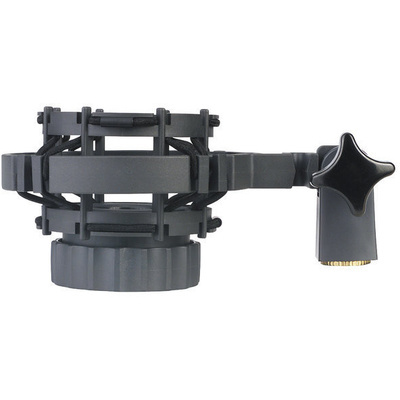 Universal shock mount for all microphones with shaft diameters from 19 to 26 mm, e.g. C 414 B-XLS und C 414 B-XL II. The outside ring has been reduced in diameter from 120 mm to 100 mm. The clamping range has been increased from 22 - 26 mm to 19 - 26 mm to accommodate microphones with cylindrical or conical bodies or connectors including, e.g., the AKG Blue Line and ULS Series. The H 85 shock mount keeps a lower profile than the H 100 and therefore looks better on the microphone, and also matches several other AKG studio microphones, e.g., the C 2000 B, C 3000 B, and C 4000 B. At present, the only microphones including an H 85 shock mount as a standard accessory are the C 414 B-XLS and C 414 B-XL II.